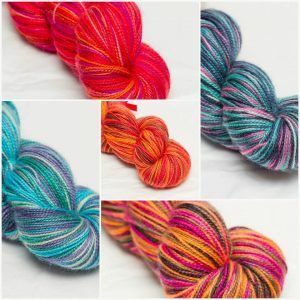 Hot on the heels of Pearl Jam inspired yarn comes ABBA! That’s right, our third collection of Baa Baa Beats is available now and takes its inspiration from the music, costumes and original singles artwork of the 1970s Swedish disco foursome. 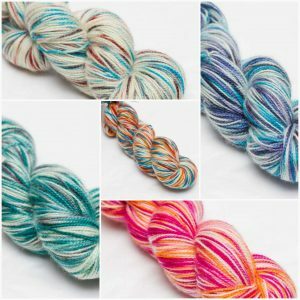 Baa Baa Beats consists of unrepeatable, exclusive, one-of-a-kind, hand painted skeins that take their names from song titles. Our latest release includes ‘Waterloo‘, ‘I Have A Dream‘, ‘Mamma Mia‘, ‘Dancing Queen‘ and ‘Honey Honey‘. The first Baa Baa Beats collection was inspired by the music of California based band, Counting Crows and included ‘Sullivan Street’, ‘Perfect Blue Buildings’, ‘Miller’s Angels’, ‘Hard Candy’ and ‘Mercury’. 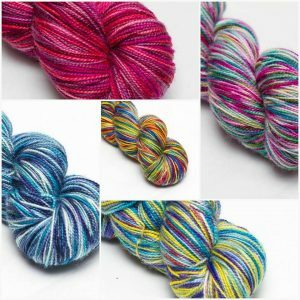 The second batch was inspired by the work of Seattle band, Pearl Jam and included ‘Jeremy’, ‘Even Flow’, Corduroy’, ‘Indifference’ and ‘Amongst The Waves’. Both previous sets of Baa Baa Beats sold out within a few days of going on sale so if you’d like to be the proud owner of a skein of woolly ABBA memorabilia then best be quick. We have already received requests for collections inspired by The Beatles and Metallica. If there’s a musician that you would like to see featured in the Baa Baa Beats collection, why not get in touch with your suggestions?